Today is Blue Monday. Regarded as a the most depressing day of the year, it’s the time when a weighty mix of gloomy weather, credit card debt and general fatigue feel their most heavy. Blue Monday was also the day a copy of Rend Collective’s latest album landed in front of me. 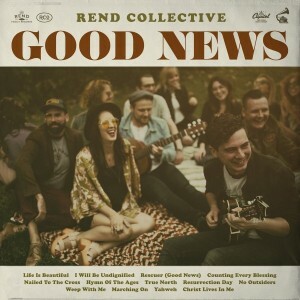 Good News, the 8th album from Rend Collective, leaps from the gate with sounds of a carnival, cinematic strings, infectious joy and dancing flutes. Listening to ‘Life is Beautiful’ is like dashing through a hay-field; it’s relentless in wonder, fast paced, and calls to rejoice at any and every opportunity. And there we find the very core of the album: learning to rejoice ‘in the sunshine, in the sorrow’. Good News is also Rend Collective at their most breathless. Not since Build Your Kingdom here have the band seemed so animated and driven by passion for meaningful praise and celebration. ‘I Will Be Undignified’, ‘Life is Beautiful’, and ‘True North’ all race with a heady excitement that is thoroughly infectious. And then there is ‘Marching On’. A crossover with Hillsong Young&Free, the song is a party song through and through. Mixing Chris Llewellyn’s impassioned vocals with the distinctive electronic pulse of Hillsong Young&Free, ‘Marching On’ is, in more ways than one, a stand out track. I don’t think anyone will disagree that in this time people need some good news. Stories that unpick the very worst in humanity, and the dire circumstances and struggles of just surviving, occupy a greater part of our minds than ever before. Bad news can feel near deafening when it’s all we are exposed too - which is why, in part, this album feels almost vital. In the slower moments of songs like ‘Weep With Me’, we are encouraged to cry, the plea with God, to ask for help - and to recognise the cracks where God’s light shines through. Whilst it may seem contradictory to have a song of lament in an album called Good News, what is remarkable is the band’s recognition of times of sorrow. As with films like ‘Inside Out’, the Good News’ message isn’t that we are called to be perpetually giddy. Rather, there is room for sadness, as well as joy. It’s not all about how we feel, though. There is a wider world that needs good news and compassion just as much as you do. Any of that sound familiar? Drawing a parallel between spiritual salvation and being a refugee isn’t merely attempting to be relevant, contemporary, or smart with its metaphors. We are called to show the exact same compassion God showed to us; we are to see those fleeing tragedy as God once saw us. Describing Christ's cross as an ‘open door’ is a challenge to us all. A challenge to be Good News, as well as sing it. And that is what I love most about Good News. It places worship music firmly in the world, and in life - not as something kept seperate, secret, or closed off. Good News does not pretend bad news doesn’t exist; it just knows which of the two is louder. Due for release 19th January 2018, you can order Good News today!